When Franz Wisner is dumped by his fiancee only days before their wedding and then demoted at his job a week later, he knows his life is in need of a change. Touched by his brother Kurt's care and concern when he helped Franz make phone calls and cancel plans, he decides to go on with the wedding, without the bride. 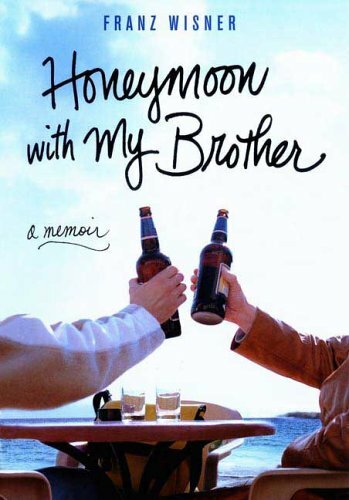 Also unable to cancel his honeymoon plans and in a delirium of love and appreciation for his friends and family who came to his "wedding" to support him, Franz asks his brother to go on his honeymoon with him. Though instead of champagne and rose petals, they ask for beer and double beds. While on their honeymoon of sorts, the brothers decide that they need an even bigger change in their lives and set out on a year long adventure around the world. I have read many travel memoirs, and after a while, you'd think I'd start to get sick of them, but I continue to eat them up. I enjoyed this one just as much as the others, and I especially loved how Wisner told part of the narrative through letters to his ninety-nine-year-old step-grandmother, LaRue. She was an integral part of the story because she was one of the few people in their lives who encouraged the trip. Just as with anyone who travels for an extended period of time, Franz and Kurt find themselves changed to their very core. Life back in California will never be the same. A barefoot man in drawstring shorts pushed an old bicycle out of the bush. He hopped on and decided to ride along in silent partnership, slowing his pedal to match my pace, occasionally yelling words of encouragement in a tongue I could feel but not understand. Then a happy, shirtless boy, no more than seven, legs speckled with clay, ran out of a shack, using all his speed to catch me. I slowed. After a handful of hollers, a few of his playmates joined him from compounds along the road. Boys and girls devising entertainment in a world without The Wiggles or Dora the Explorer. Now there were a dozen in the parade, with the man on the bicycle our grand marshal. The sun cast lengthy shadows across the road. Darkening but still warm The children's giggles mixed with the music. Down to a fast walk now while they still ran, I stared, trancelike. Oh, those faces, those high-octane, pure-joy faces with teeth bent and noses crusted. The kids yelled and pumped their hands in the air as if they were prizefighters after a TKO, forcing me to stop beceause I was laughing so hard. The smallest of the group, a little girl, pushed through the others. I could see the dress she wore was no more than a bedsheet with some creative stitching. It couldn't hide a bloated belly or limbs that should have been longer. What she didn't have in size, she had in affection and elan. Curiosity pushed her to swipe my leg, then stare at her fingers. I smiled and she reciprocated by hugging my knee with all her body would allow. Soon, too, the others. A father's voice from a hut pulled them off my leg and forced a trot back to their homes. The man on the bicycle pedaled ahead. I stood in the middle of the dirt road, frozen, and I started to cry. Here was Africa.